In my mother's backyard stands an apple tree that is roughly 40 years old. The trunk diverges, v-like, forming a perfect spot for standing or a nest for young children to sit in while surveying the seemingly endless backyard. My childhood is fruited with its apple-tree memories. I remember the heavy branches in the fall, sagging with ripe red-green apples, many dropping to the ground for birds to peck and nibble. Those tart apples still make the best apple pies I've ever had, especially when baked by the hands of my Grandmother, Dorothy. One bright day each fall was designated for apple harvest. Out came the tall wooden ladder and as many paper sacks as we could gather. We picked and filled and picked and filled until the tree was emptied of her fragrant offering. 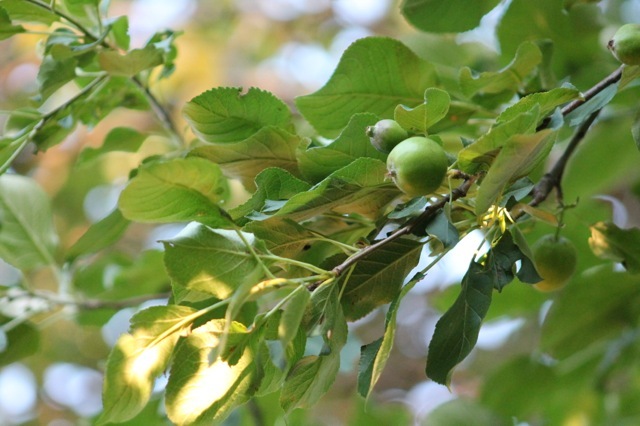 When we were back home in June, I wandered out to that old apple tree and looked up into its healthy branches. 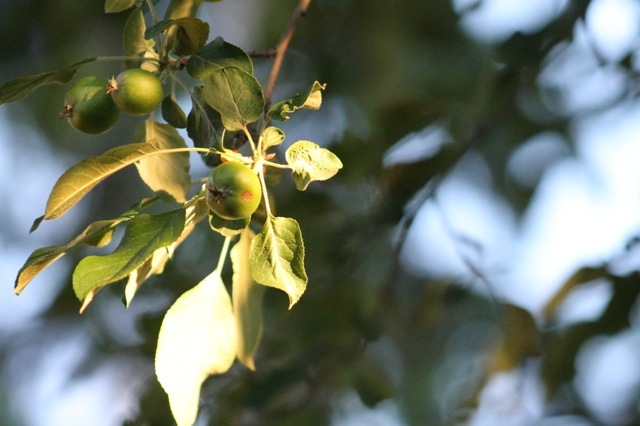 Clusters of golf-ball sized baby apples appeared to me like Christmas ornaments, illuminated by the golden sunlight filtering through the leaves. I wish I would be there for the fall harvest this year. I wish I could bring home sacks of our family apples to peel and slice into my own pies, crisps, and applesauce recipes. But it is simply encouraging to see that after all these years, that one tree stands strong and fertile, requiring no particular effort from my mother for it to go about its business year in and year out: budding, leafing, flowering and fruiting; simply growing on. What great memories, what grace filled memories. What a great post! You've got me thinking about this tree in our yard, which one son in particular loves to climb, and just sit in for hours reading or just relaxing. I hope that when he's all grown he looks back to that tree with such fond memories! Lovely post! It's on my "bucket list" to see a real apple tree loaded with apples, to photograph and then to pick apples from it. We have an apple tree too. The apples (macintosh) get better every year. They are mostly still smallish and green though, and the baby LOVES them. His second word was APP-LLL. He still finds them and will eat one for a long time...and carry it around all over the place.